Background: A patient's satisfaction with nursing service is one of the main indices for measuring the quality and effectiveness of health care. Objective: The purpose of this study was to investigate and compare patients' satisfaction with the nursing service provided in selected training hospitals in Tehran. Methods: This cross-sectional study was conducted in 2013 using Patient's Satisfaction Standard questionnaire (PSI) in 7 selected training hospitals in Tehran. In this study, 336 patients discharged from 4 major units of each hospital namely internal, surgery, obstetrics and gynecology and pediatrics, were selected and studied randomly. Data were analyzed using the SPSS18 software. Results: The results of this study showed that the pediatric unit recorded maximum patients’ satisfaction with nursing care with a mean and SD of 3.78±0.68, while the surgery unit recorded minimum satisfaction with a mean and SD of 3.35±0.65. Also, a significant difference was observed between patients' satisfaction with nursing service in major units such as internal, surgery, obstetrics and pediatrics (P=0.015). Conclusion: However, significant differences were found in terms of degree of satisfaction with nursing service between the major units of the hospitals. These differences may be due to the characteristics of providing care, unit, patient or family. Therefore, future research should be conducted in order to identify the cause of the difference in satisfaction between the different hospital units. Chen Y, Liu J, Xiao S, Liu X, Tang X, Zhou Y. Model construction of nursing service satisfaction in hospitalized tumor patients. Int J Clin Exp Med. 2014;7(10):3621-9. Zaboli R, Zarandi MRS, Ayoubian A. A comparison of service quality in teaching and non-teaching hospitals: the Gap Analysis. Int J Travel Med Glob Health. 2015;3(1):37-41. 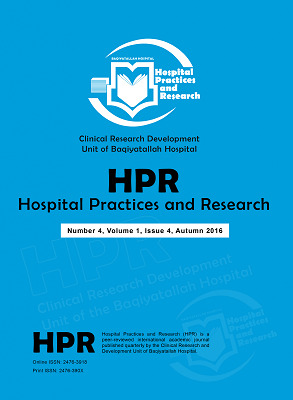 Ayoubian A, Dopeykar N, Mehdizadeh P, Hoseinpourfard M, Izadi M. Surveying the Quality of Care Services in a Military Health Center According to the SERVQUAL Model. J Mil Med. 2015;16(4):225-9. Hajinezhad M, Rafii F, Jafarjalal E, Haghani H. Relationship between nurse caring behaviors from patients’ perspectives & their satisfaction. Iran J Nurs. 2007;20(49):73-83. Joolaee S, Givari A, Taavoni S, Bahrani N, R R. Patients’ satisfaction with provided nursing care. Int J Nurs Res. 2008;2(7):37-44. Peyrovi H, Bahadori A, Ashghali-Farahani M, Haghani H. Comparison of in-patients' satisfaction with different domains of nursing care. Q J Nurs Manag. 2013;2(1):59-66. Seidi M, Hydary A, Karami SR. Medical and nursing services and patients' satisfaction level. Iran J Nurs. 2005;17(40):55-61.